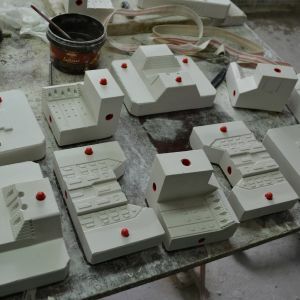 The blue resin mother mould from where the production mould are made. 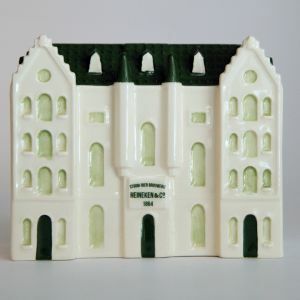 To commemorate 150 years of Heineken’s existence, three of the brewery’s landmark historical buildings are to be issued in miniature. Two of these miniatures are made for Heineken by the China manufacturers Royal Goedewaagen in Nieuw-Buinen. 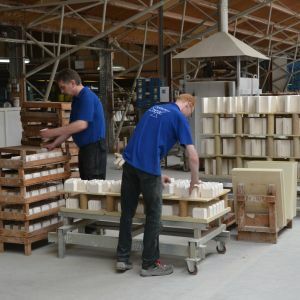 Goedewaagen has been in existence since 1610 and has a worldwide reputation for its handmade ceramics. In 1932 Goedewaagen issued the first Delft blue miniature of a historic building. Since then they have produced more than four hundred different miniatures commissioned from all over the world, including polychrome painted Amsterdam canal houses and a series of Dutch windmills. 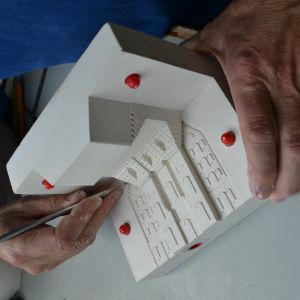 Goedewaagen are in the forefront when it comes to the application of technology for translating a two-dimensional design drawing into a three-dimensional matrix of the miniature. 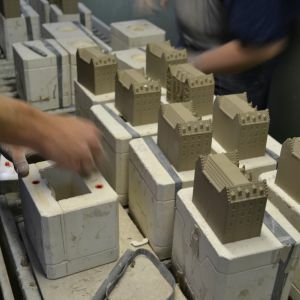 But from that stage on, the methods used in production are completely traditional; the miniatures are poured into moulds and subsequently painted entirely by hand. 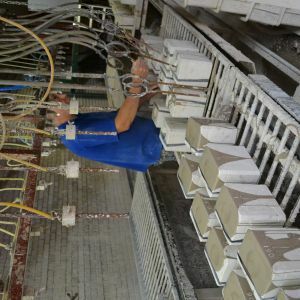 Royal Goedewaagen is the only china factory in the Netherlands still working according to this craft tradition, which deserves the title of national ceramic heritage. The third Heineken miniature is made on commission for KLM. 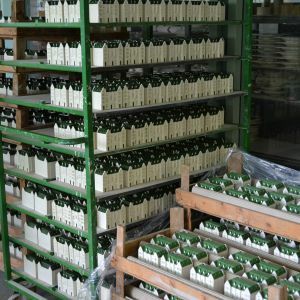 Since 1952 the airline company has given every passenger in business class a Delft blue miniature of a characteristic Dutch building, filled with jenever. 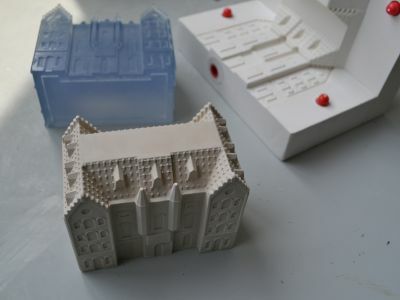 Between 1965 and 1995 Royal Goedewaagen produced these miniature houses for KLM. Today they are made in China. 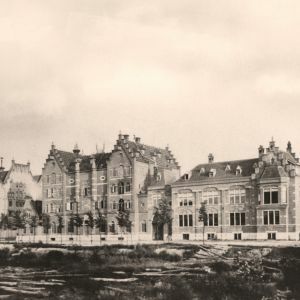 In 1867, just outside the Singelgracht Gerard Heineken had a new, modern steam brewery built after a design by the architect Isaac Gosschalk: a modern brewery driven by steam engines. 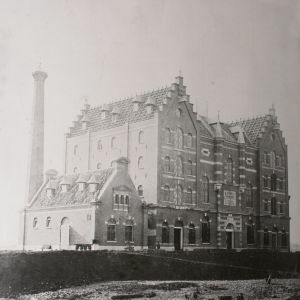 Three years earlier, in 1864, Heineken had taken over the centuries-old brewery De Hooiberg (the Haystack) in the centre of the city, but this was incapable of meeting the demands of the new age. A new brewery was essential. The new steam brewery consisted of two parts: the brewery itself and next to it the boilerhouse with the steam engine, behind which stood a tall chimney. The main building was of a symmetrical design. On either side, component buildings with step gables served as storage place for malt, hops and barrels, and partly as a cold store. The middle section, in whose facade two small towers high up flanked a large bow window, contained the brewhouse and behind it a fermentation chamber. There was also an office. A monumental gate gave access to the brewery, with the name of the brewery and the year of its completion set above the gate. 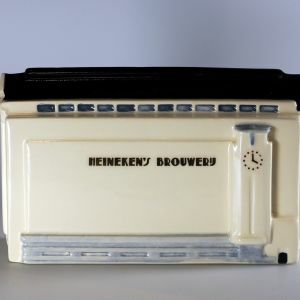 In the miniature that date has been replaced by the year in which Heineken purchased his brewery. Year after year, the brewery extended further round this first construction, until finally there was a whole complex of buildings standing on the Stadhouderskade. 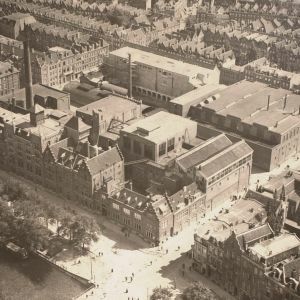 Eventually, in the thirties the old brewery had to make way for new building. The miniature of this first building is in Heineken’s green rather than the traditional blue. The brewhouse from 1913, designed by the Rotterdam architect Arie Heederik, is the oldest part of Heineken’s brewery complex still standing. Earlier, malt was brewed in warm water here in huge brew-kettles to produce wort, the basis for beer. Nowadays it is the heart of the Heineken Experience. The brewhouse is a sturdy yet graceful building, its facade as though crowned by two square towers. Decorative patterning in red brick and grey natural stone surrounds the windows. The decoration is in the style of Art Nouveau, as are the stained glass windows. 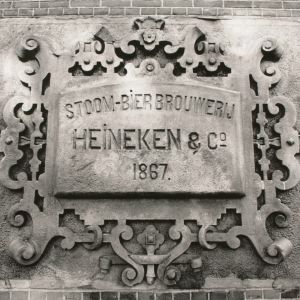 A large tile plaque is set prominently in the facade proclaiming the name of the brewery: Heineken’s Bierbrouwerij Maatschappij. The brewhouse is issued in miniature as the 95th ‘KLM house’. 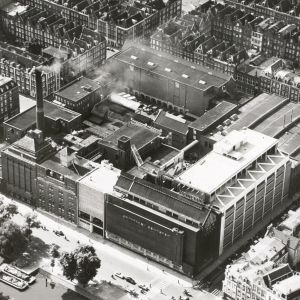 The most conspicuous building of the former Heineken brewery is the large building on the corner with Ferdinand Bolstraat. 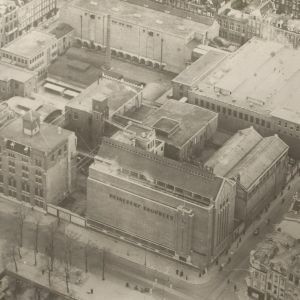 Architect Bert Ouëndag designed this in 1932; after his death it was completed in 1935 under the direction of his son Willem. It mainly housed yeast cellars and lagering cellars for the first fermentation and the maturing of the beer. The facade of this tall, massive-looking building is almost devoid of windows – for a reason: no daylight must enter the cellars. Only the ground level course originally had a row of windows. On Ferdinand Bolstraat the building has a gabled facade. Along the Stadhouderskade a projecting section of the facade reminds one of a church tower with a clock above. Initially the name Heineken’s Brouwerij in large gold-coloured letters emboldened the facade , but the ‘s’ was removed in the nineteen sixties, as a result of which there is now too much space between the two words. The so-called coolship at the very top of the building did have windows. There stood huge vats of boiling hot wort, piped direct from the brewhouse. With the windows open the wort could be quickly cooled before adding the yeast that would convert it to beer. The ceiling was slanted to ensure that all condensation would run downward. 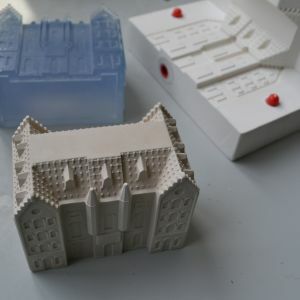 The miniature of Ouëndag’s building is issued in a limited edition.